Here is a review for the dads to be. Talk about an exciting Baby Shower gift! Daddy Scrubs has scrubs just for that special moment at the hospital and of course to be worn afterwards too! Daddy Scrubs are really neat! Look at their expectant father gifts! Now, my husband is going to wear his Daddy Scrubs as PJs. They are so very comfortable. I thought about hijacking the top one night! The pocket on the top says "DADDY" and then the back says "I'M THE DADDY". My husband put his on the minute they came in! Yes, I know I am not expecting, but he is a DADDY! I had a hard time getting pictures before he got his hands on them. DaddyScrubs introduced its line of Daddy Gifts, including their signature DaddyScrubs, I’m the Daddy™ tees, hoodies, hats and accessories in September 2009. This trusted and unique brand was created by a Dad – for Dads – in every stage of fatherhood, from frantic first-timers to the calm, cool and collected veterans of the maternity ward! The brand was built upon the premise that new Dads deserve to feel special and comfortable during one of life’s most exciting – and most important – times. We’re talkin’ labor, delivery and beyond! The DaddyScrubs brand reaches beyond “Dad” – and provides the absolute perfect gift from moms, sisters, sister-in-laws and wives for that special “father” in their lives! “It’s a great gift from just about anyone who wants to show their love and appreciation to an expectant father,” says Robert. All Daddy Gifts by DaddyScrubs are available exclusively online at DaddyScrubs.com. 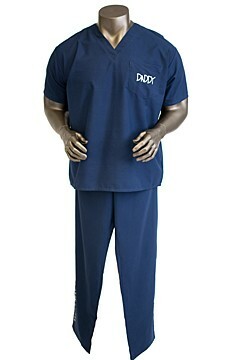 I am thinking any dad would love a pair of these Daddy Scrubs, not just daddies to be. They are a great momento of that joyous occasion. Even though this is about Baby Showers, remember Father's Day is just around the corner! Dads often get left out of the Baby Shower and gifts and excitement and this is a great way to include dad! Daddy Scrubs actually has other daddy to be gifts and sets available for the Dad to be, so be sure to stop by and take a look around. Be sure to follow them on their Social Media. You can find them on Facebook HERE. Then swing by their Twitter page HERE. One neighbor will receive a pair of Daddy Scrubs. They are also offering a discount, Coupon Code: BLOG13 to receive a 10% discount on their website. My favorite is the Vintage Hoodie Pacific Blue. Love the Super Daddy Tee. I love the navy scrubs! Oh I really love the DaddyScrubs Classic - Edgy Navy! I also like the hoody.